A.W. 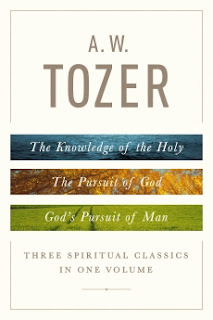 Tozer Three Spiritual Classics in One Volume: The Knowledge of the Holy, The Pursuit of God, God's Pursuit of Man, published by Moody Publishers is a new release of three classic books. The new generation of readers may not be familiar with the classic Christian works written by Tozer which were first published in the 1940s and 50s. Even as far as a generation ago, Tozer became aware of a change in the attitude of Christian believers, feeling that a "rediscovery" of faith was needed. The author recognized the need to rejuvenate one's faith. His words are just as true and applicable to today's readers as they were 70 years ago. This collection of his three most influential works are presented in one easy accessible volume. Tozer's writing style represents a different and more traditional style in contrast to today's generation of Christian writers and pastors. Although the writing style is traditional, it is not difficult to understand. The easy to read sized font, is the perfect size, especially for those readers who find classic literature to be daunting. This three volume set is a great way for the new generation of readers to explore classic Christian literature and also bears testament that many of the issues we face in today's generation are longstanding spiritual issues faced by previous generations of believers as well. While it is true that nothing can replace the reading of the word of God for oneself, there is much value in having a spiritual mentor to guide your way through life and faith. A.W. Tozer is a spiritual mentor whose words speak to multiple generations of believers and seekers as well. He was a self taught theologian- led by the spirit, and did not benefit from expensive years at seminary colleges and universities. His insight offers hope for all of us believers who learn from the Holy Spirit's direction. This three book volume is not a book to be skimmed, but rather to be read slowly in order to reflect on the powerful thought. Those who take the time to read and to meditate on his message will be rewarded with spiritual fuel. While this book is considered theology, those who follow along, processing the messages internally will have a greater insight into God and God's powerful divine attributes including perfect justice, supernatural wisdom and transcendence. From there, the reader is guided in pursuing God and drawing closer. The reader receives enlightenment on the barriers from drawing close to God, and with this awareness, how to overcome these barriers. Finally, Tozer explains how God pursues each and every one of us in a personal relationship through the word of God, the bible, as well as the Holy Spirit. The believer is taken through an instructional course from start to finish, beginning with a discussion of who God is, and the powerful and unimaginable attributes, how to find God, and finally how God reaches out to us. 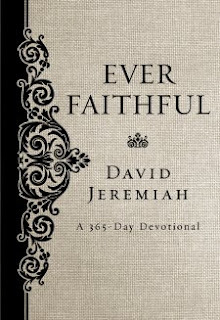 I recommend this treasure for all readers who are looking to grow their faith. For those who take the time to dig into this treasure, the reward will be a greater insight and insight into the greater picture of faith. As a blogger I received a copy of this book published by Moody publishers for the purpose of this review. 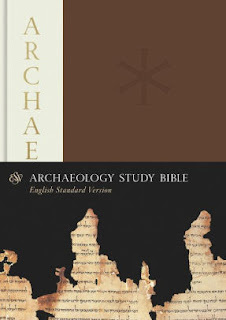 The Archeology Study Bible, featuring the English Standard Version, is a beautiful compendium of archeological information side by side with the bible text. The bible features a large number of full color photographs, graphs ,in-depth articles as well as study notes at the bottom of the page. The larger sized font, makes this bible perfect for daily reading and study as well. The presentation of this bible is as beautiful as well as useful. The hardcover, with its golden embossed letters and decorated spine presents a dignified presentation to make this bible suitable for gift giving as well as having it on display as part of a treasured library. Of all the archeological themed bibles on the market, this bible has the most useful as well as the most practical features making it the best choice for personal study. Although this bible is most likely to appeal to those bible readers who want to dig deeper into the historical and archeological foundations of their faith, I believe that historians, students as well as history teachers will also appreciate this bible as well. The in-depth full length articles will give the reader a thorough foundation into archeology and how it correlates to the bible. This bible will expand the foundation of one's faith through seeing the historical roots in context of the bible text. This bible brings the world of the old and new testaments to life, giving the reader a taste of the ancient cultures, societies, politics and daily life of the ancient times. In sum, to what makes this bible stand apart from other bibles in the archeological- historical genre are the following: Beautiful graphical presentation with color photographs, graphs and illustration, Easy to read font, full length articles featuring topics such as geography, coinage, history and dating methods, the accurate, yet modern English Standard Version. This hardcover volume is made with quality durable materials- giving the bible the dignity it deserves. The binding will last though years of use. In contrast, I've seen other study bibles with covers and binding that don't even last a single year of daily use. This bible also includes traditional features such as an in-depth concordance, maps, and presentation page on thick card stock paper. Many modern readers of this new generation may be more familiar with the NIV or the New Living bible translations. The English Standard Version is not difficult to read, yet it is very accurate. I believe that readers who enjoy the NIV, should give the ESV a try. I'd recommend this bible for long standing bible readers as well as for those who are new to the bible. As a blogger I received a copy of this bible published by Crossway for the purpose of writing this review. 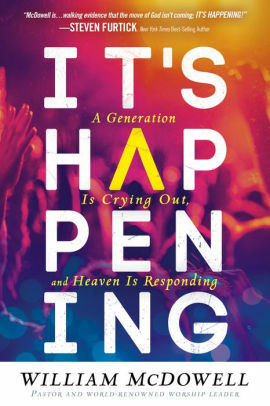 It's Happening: A Generation is Crying Out, and Heaven is Responding by William McDowell is anew inspirational book that is certain to motivate even the most apathetic and skeptic readers into a greater faith. Rather than seeing faith and Christianity as a passive existence, a daily routine of attending church or bible studies, McDowell shows the reader how each and every believer can be a part of a revival movement. Many Christians are familiar with the book of Acts of the new testament and the early spread of Christianity. Many look with awe at a time many believers were filled with the Holy Spirit and capable of great acts of faith, a catalyst to revival. Those days are not simply part of the historical roots of faith. Revival and the work of the Holy Spirit, does not simply disappear in modern times. Author, William McDowell shows the reader that the Holy Spirit has a presence and that not only is revival possible, but it is in fact actually happening right now. The author speaks personally to each and every reader, to offer encouragement as well as direction as to how to become part of this movement. As a pastor at Deeper Fellowship Church based in Florida, this book was inspired by a revival movement that he himself witnessed within his church. Throughout the text, personalized prayers are included so that the ready may share in becoming spiritually ready to participate in the revival movement. This is a book to reach a new generation of believers, capable of transforming lukewarm, apathetic believers into those willing to sacrifice to witness for the truth. As a blogger I received a copy of this book published by Charisma House for the purpose of writing this review. Published by Thomas Nelson Really Woolly I Love You, Little One is a new board book for babies and toddlers featuring the sheep character named Really Woolly. The small sized book with the padded cover is perfect for young children to hold and carry. 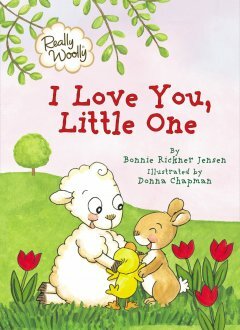 Cartoon characters of Wooley with his friends that rabbit and chick are inviting to young readers. Each two page spread features a new theme, bible verse and a short devotional passage. Also featured is a short prayer children can read along with parents to introduce them to daily prayer. This little book is perfect to be read before bedtime or any time of day. As a blogger I received a copy of this book for the purpose of writing this review. Monsterland Reanimated by Michael Okon is the newly published sequel to Monsterland. In the post apocalyptic world which takes place where Monsterland ends, the young hero, finds himself adjusting to the new reality as well as a new set of unimaginable creatures. Whereas the first theme park featured Zombies, Vampires and Werewolves, out of the newly resurrected ruins of Monsterland, emerge even more horrific abominations: a new breed of mummy like creatures, an oozing glob-like monster, as well as the reanimated, resurrected version of Vincent Conrad. monsters go beyond the ordinary, as Michael Okon, elevates the Monster Theme park to an entirely new horrible level of monster experimentation and mutants. Monsterland Reanimated is not simply a fast paced action novel, but an experience. It is as if the reader is immersed into an entirely new world, not simply a story about a monster themed theme park, but rather transported into an alternate reality of a post apocalyptic world. Okon's detailed account is authentic, and told in a matter of fact narrative, that makes the reader almost believe this is a true account of events that could possibly happen, given the right circumstances. 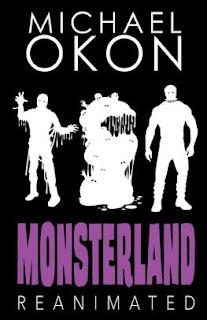 All Michael Okon fans will enjoy this long awaited sequel to Monsterland, without a doubt. 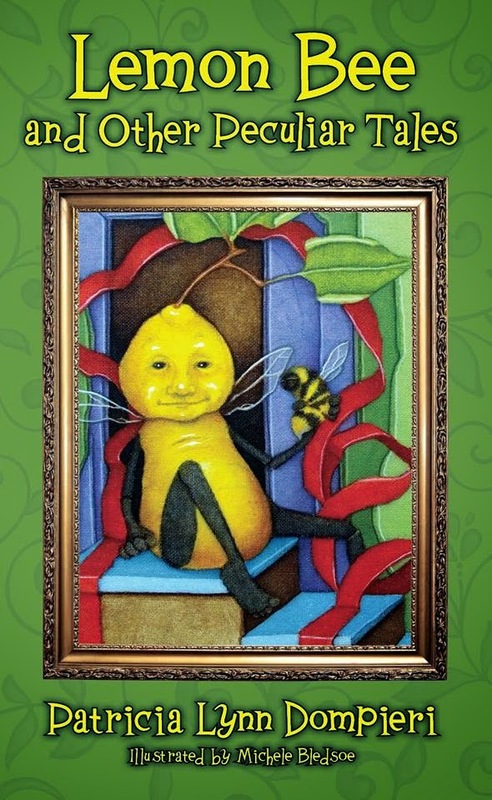 This book is available online on Amazon as well as Barnes and Nobles. I recommend Okon's books for any fan of fast paced contemporary horror.